« Putting the ‘Protest’ back in Protestant! Get ready for one of the biggest gatherings of founders, movers, and shakers in the LGBTQ+ ecumenical faith world. October 31-November 2, 2017, in St. Louis, prophets young and old will tell the stories of our history and explore our future at Rolling The Stone Away. Special guests include the Rev. Chuck Lewis, Leo Treadway, Nicole Garcia and many others from a variety of backgrounds and faith traditions. The Rev. Dr. Megan M. Rohrer is serving on the planning team as the Lutheran representative for ELM and ReconcilingWorks. 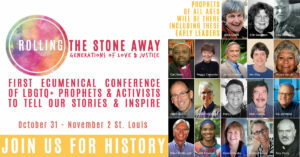 Rolling The Stone Away is a conference of elders, saints and prophets from all generations to honor the ground-breaking achievements, relentless commitments, and often painful sacrifices many have made in religious organizations over the past five decades and to inspire the next generations to push forward. The LGBT Religious Archives Network ecumenical planning team is committed to preserve, celebrate, and learn from the history of LGBTQ+ justice groups and activists in Christian faith traditions. Together we will worship, listen, reflect, and plan. This entry was posted on Thursday, June 8th, 2017 at 5:00 am	and is filed under Blog. You can follow any responses to this entry through the RSS 2.0 feed. Both comments and pings are currently closed.